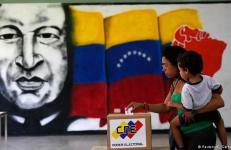 Venezuela - Chavismo wins 18 out of 23 regional governments, opposition 5. The governing PSUV and allied parties won in the states of Amazonas, Apure, Aragua, Barinas, Bolívar, Carabobo, Cojedes, Delta Amacuro, Falcon, Guarico, Lara, Miranda, Monagas, Sucre, Trujillo, Yaracuy, and Vargas. The opposition alliance MUD won 5 states: the Democratic Action (AD) party won Anzoátegui, Merida, Nueva Esparta, and Táchira; Primero Justicia won the strategic oil rich northwestern border state of Zulia. While the results of 22 states were announced a few hours after polls closed, the votes in Bolívar were recounted due to the small margin between winner Justo Noguera Petri of the government forces coalition and the opposition candidate Andres Velasquez. Petri finally won with 276,655 votes, while the MUD-candidate gathered 275,184 votes. According to Electoral Council CNE, 61.14 percent of Venezuela’s 18 million electorate participated in the regional elections, the second highest voter turnout in regional elections after the 65.45 percent turnout in 2008. The PSUV and allies won 54% of the total vote on a national level, marking an important recovery since their huge defeat in the 2015 parliamentary elections when they won only 40.8% of the vote. The right-wing opposition coalition MUD won 45% of the vote. In the parliamentary elections 2015 the participation had been 75%. While the PSUV could maintain more or less their electorate in absolute numbers, the opposition lost 2.2 million votes relative to 2015. In the regional elections of 2012 government parties won 20 out of 23 regions. But most media and polls were expecting them to lose much more states than they did. The economic crisis since 2014, the violent opposition protests causing 140 deaths, the US pressure and international economic and financial boycott of Venezuela, high inflation, scarcity of food, medicine and other basic goods (due to speculation, smuggling, high prices, intentional economic boycott, but also to corruption, government mismanagement and failure in economic and financial policies) had reduced popular support for the government significantly and some political sectors and former Chavista politicians had withdrawn their support for the Maduro government while discontent was widespread. But polls predicting opposition victory in almost all states six months ago have been shifting rapidly towards a Chavista victory over the past 2-3 months. - First it is important to state that there is no evidence of fraud, as some opposition politicians claim and many international media and politicians suggest. Venezuela has an electronic voting system and the vote is also printed so that there can be a manual recount. The correct functioning of the electoral machines was checked and approved also by representatives of the opposition before the elections. The electoral system asks for a manual audit of 54.4% of the votes, nevertheless president Maduro called on the electoral council to carry out a “100 percent audit” of all paper ballots from Sunday’s vote. International observers were present during the elections and confirmed that there was no evidence of fraud nor even of the possibility of fraud. - The strategy of the opposition to spread violence and terror on the streets alienated a good part of its own electorate. Especially because barricades and violence concentrated very much in the opposition’s strongholds and neighborhoods. Entire neighborhoods were literally taken hostage by violent groups that made it impossible for the inhabitants to live a normal life. And the longer the violent protests lasted, the more they were taken over by gangs and groups forcing people to pay when they wanted to pass the barricades to go to work or buy groceries. While the strategy did not show the expected result of bringing down the Maduro government. - The opposition is divided. The radical factions of the opposition did not agree with participating in regional elections and called for a boycott. - The July 30 National Constituent Assembly (ANC) elections, with a turnout of over eight million people, brought back peace and brought back in the offensive Chavista rank and file after years of paralysis, desperation and defensive acting. The opposition called for a boycott of the ANC-elections, said there had been a massive fraud and participation was much lower than the government said, and did not recognize the results. Nevertheless, it seems they know the turnout was as high as the government announced: after the ANC-elections they stopped immediately the violent mobilization to topple the government and a majority of the opposition agreed to participate in the regional elections. Something they would not have done if they would have really believed that the government lost almost all support and its deposition was only a matter of days or weeks. - The elections for the ANC proved to be a good idea, even if I think the way they happened was not as good: public debate was not broad enough and the electoral machine of the PSUV imposed the party candidates and did not leave much space for radical and movement Chavismo candidates. Nevertheless, the ANC-elections reinvigorated rank and file Chavismo which had kept paralyzed over the past few years in order not to provoke violent confrontation with the opposition mobilization. With the call for ANC-elections and since then movements, rank and file and different sectors (neighborhoods, women/feminists, communes, peasants, workers, ecologists etc.) started again meeting, discussing, mobilizing, pressuring with and around the ANC. The widespread feeling of desperation, of not being able to do anything, the feeling to have to hide Chavista identity, was blown away. The ANC brought also back to Chavismo many rank and file supporters that had stopped supporting government Chavismo in the past. I have several of them as FB friends, for example workers from Bolivar’s heavy industries, who had turned their backs on government Chavismo because of corruption and missed transformation in the heavy industries and they suddenly started mobilizing for the ANC. The result is also problematic for the government. To have lost Zulia, Táchira and Merida puts it in a difficult situation. The 3 states in the northwest, bordering Colombia, are the entry door for paramilitarism, and the main corridor for the smuggling and extraction of Venezuelan subsidized food and gasoline. The 3 states are also the base for the a possible “half-moon” strategy formulated by some sectors of the opposition in the past: to follow a secessionist strategy and declare a parallel government. Zulia is also the region with a majority of oil fields. After having lost the option of winning easily through elections the opposition will also be less inclined to negotiate with the government and try to mobilize more international support for the economic and financial strangulation and international isolation of Venezuela. The US, Canada, the EU and the right-wing governments in Latin America are very likely to follow and support these calls by the extreme right-wing opposition sectors in Venezuela. Despite important victories in some key states, the opposition alliance MUD refused to recognize the electoral results – but accepts its own victories – and accuses the government of fraud. MUD campaign leader Gerardo Blyde rejected the outcome and said it was not “not reliable.” He accused the government of having provoked the opposition defeat criticizing that the CNE had relocated 334 voting centers – mainly because they were in opposition areas and targeted by violence during the elections to the ANC and that some withdrawn opposition candidates were still listed on the ballots. The accusations are ridiculous, the relocation was announced already weeks ago and done for a good reason. Moreover, transport was installed to bring voters to new election sites. And many people from poor neighborhoods have had to cover miles without organized transport in all past elections and they voted. The opposition never complained about it. The fact that some opposition candidates were still listed on the ballots was simply due to the fact that they missed the due date to officially withdraw. Some opposition candidates also admitted their defeat. So did Henri Falcón, former governor of Lara, who lost by a 17-point margin to his PSUV challenger Carmen Melendez. And the Carabobo opposition candidate also recognized his defeat. The former opposition governor of Delta Amacuro, who did not run again for office, blamed the opposition, their divisions and their choice who to nominate as candidate, for having lost the elections. And AD leader Ramos Allup, a main player in the opposition alliance, especially now that his party has 4 of the 5 opposition governors, called aggressive right-wing secretary general of the Organization of American States (OAS) Luis Almagro to stop giving external advise to the Venezuelan opposition. The result is a huge victory for Chavismo and puts it - after having been for 3 years against the wall – in a position of strength. The government has now to deal urgently with the economic and financial situation, combat corruption effectively, democratize the PSUV and go back to participative politics that marked the Chávez era, strengthening again communes, community councils and go back to support workers control and self-management. The economic and political crisis had pushed the government to reduce participation and rely on centralization, top down decisions, opening to transnational capital. If the government does not do that it seems unlikely that they will be able to repeat their victory in the presidential elections in 2018.